Despite inspiring some heady off-road adventures, Toyota’s retro-styled 2014 FJ Cruiser is saying sayonara after this year. Apparently the Japanese automaker has decided that its full-size, mainstream-oriented Land Cruiser sport ute is more marketable than its midsize, 5-seat FJ Cruiser SUV, with the latter yet again burdened with cramped rear quarters and a set of all-but-useless reverse-opening, half-size rear doors. Heck, even tepid mileage and performance numbers never really made much sense in this pint-size, tough-talking version of one of the more capable rock crawlers available. Needless to say, the FJ Cruiser cruises into its swansong year understandably little changed from its 2013 iteration. In fact there have been few significant changes since this scaled-down sport ute’s 2007 inception. The single rear-wheel-drive (RWD) Base trim offered can be subdivided into the Base 4WD MT (4-wheel drive, manual transmission) and the 4WD AT (4-wheel drive, automatic transmission). Each of the trail-blazing sub-trims can be delivered with full-time or part-time 4WD, with the former essentially an all-wheel-drive system and the latter boasting a manual transmission, auto-locking hubs and hi-lo gear selection. Both 4WD variations also sport a locking rear differential for some admittedly hefty all-terrain capability. Powering this downsized ute is the traditional 4.0-liter V6 engine that puts out 260 hp, with the Base RWD FJ Cruiser, as well as its go-anywhere 4WD AT sibling, each packing a standard 5-speed automatic transmission. The part-time 4WD MT, as mentioned, flaunts a 6-speed manual transmission. No matter the gearbox, look for some 271 lb-ft of torque out of this throwback ute, while towing is maxed out at 5,000 pounds with the proper equipment. Meantime, fuel efficiency, despite variable valve timing, is estimated at a less-than-inspiring 16 mpg city/20 highway in the automatic-toting RWD variant, 17/20 in the Base 4WD AT and a downright ghastly 15/18 in the stick-shift-laden 4WD MT. Standard appearance and cabin bling in the Base 2014 FJ Cruiser continues to be unimpressive for its rather hefty price tag, with 17-inch steel wheels and skid plates adorning the profile, and water-resistant premium cloth upholstery, full power accessories, tilt-wheel steering and air conditioning standard inside. Entertainment, meanwhile, remains provided by a single-CD player sporting 6 speakers, satellite radio and a USB port, with all of it bolstered by Bluetooth hands-free calling. Cruise control, a rear-view camera, upgraded and upsized wheels, upgraded off-road suspension components and an 11-speaker JBL premium sound system with 6-CD changer are all offered as options in various packages, along with the Trail Team Special Edition package flaunting all-terrain tires, an off-road-tuned suspension and an electronically locking rear differential. Notable standard safety equipment aboard the various FJ Cruiser sub-trims for this, its final year, includes 4-wheel antilock brakes (ABS), traction and stability control, front and rear head airbags, front side-mounted airbags and front head restraint whiplash protection. Turn-signal-integrated mirrors also come standard, as do daytime running lights, while rear window wipers are optional. 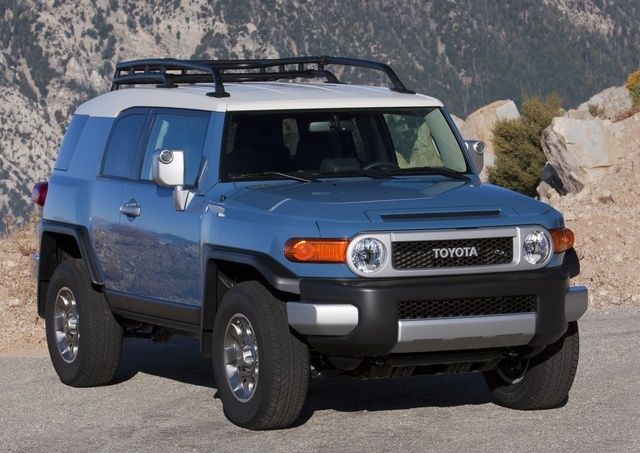 What's your take on the 2014 Toyota FJ Cruiser? Robert The 6-speed manual transmission (MT6) comes with full-time four wheel drive (AWD) and has since the vehicle came out in 2007. That's why it has such a significant drop in fuel economy. The rear seat is not particularly cramped, check the numbers or crawl into one, the rear is as roomy as any compact/mid-sized SUV gets especially considering the large cargo area. The problem is the lack of a grab handle for the rear entry, and the fact that suicide doors are always a compromise between sportiness and accessibility in any vehicle. 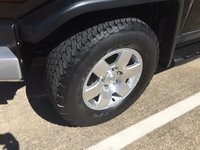 No FJ Cruiser has auto-locking hubs, the AT models come with a front auto-disconnecting differential (ADD), and the MT is full-time four wheel drive (AWD) with a center differential that can be locked. The vehicle is not a "ute" a ute is a unibody pickup truck, a popular vehicle in Australia. This is a Compact SUV. This vehicle hasn't just "not changed much" since 2013, is hasn't changed much since it's 2007 model release year. In 7 years the vehicle has gotten, a couple of new accessories, radio changes, a slight engine update with better variable valve timing, LED tail lights, and a few special editions. Hefty pricetag? It's the second cheapest base priced vehicle in Toyota's rather large SUV lineup. David Robert destroyed your contributor! Nice work Robert. TheHorror Tallberg's reviews leave me wondering if he actually drives what he writes about. There's little more than a recitation of the factory specs. ArchitectOfDays This post was last updated before the 2014 model even came out? This review is ridiculously biased and factually incorrect. stewaar Pitiful review. Look at the 2013 review then read this one. A world of difference (2013 being the accurate of the two). W Seems you all have this guys #. lol I was going to give my own critique of his review but seeing your comments has decidedly given me nothing more than specific finger pointing to do. And it just is not worth it. I will merely point out that the replacement to the FJ Cruiser is not the Land Cruiser. It is the 4Runner TRD models. And with their extra technology incorporated into them, the FJ Cruiser has only been improved upon. The 4Runner TRD models with some body armor and tire changes will be going to the same places if not more as the FJ Cruiser has. The difference is, how much easier it has become. Crawl control, rear locking diffs. and the terrain select modes take this class in this price range to a whole new level. 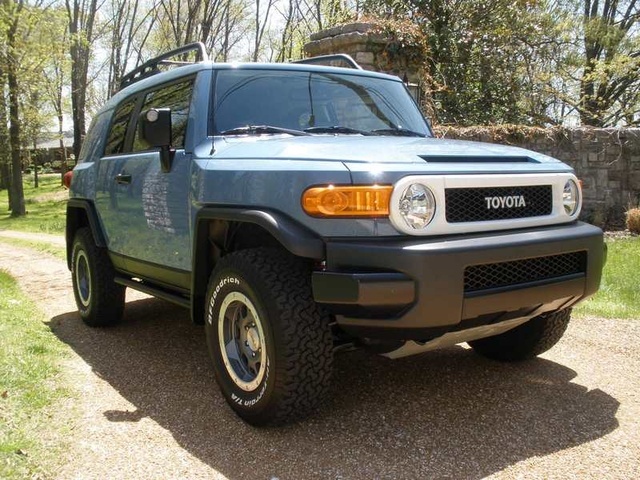 Have you driven a 2014 Toyota FJ Cruiser? How much should a rebuilt title effect the cost of a vehicle?